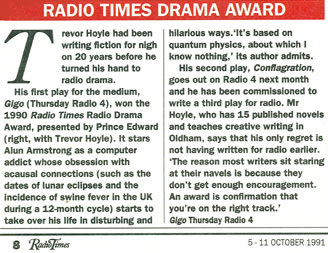 Winner of Radio Times Drama Award for best radio play. This comedy-drama stars Alun Armstrong as a man whose obsession with acausal connections - lunar eclipses, the meaning of time - starts to take over his life. Is he living in a quantum dream or is the dream living him? Also broadcast on NDR Hamburg. After colliding with a Blackpool tram in his Lagonda, Wigan's famous rude comedian Frank Randle is admitted to hospital in Rochdale for psychiatric observation. The play traces Randle's helter-skelter career and tragic end due to drink and tuberculosis. 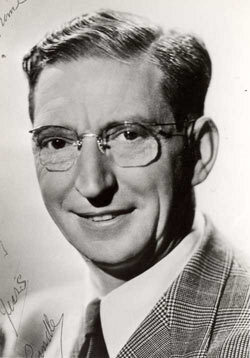 Keith Clifford won the Sony Award for best actor in the title role. "I enjoyed yesterday's play about Randle, who has just had a blue plaque put up on Blackpool's North pier to commemorate his death fifty years ago. 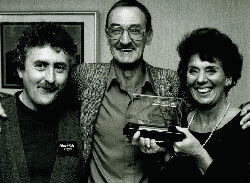 Keith Clifford, who played Randle brilliantly, deserving his Best Actor Sony Award, recently left Last Of The Summer Wine. Another cast member, Jean Ferguson (Marina) portrayed the late comedienne Hylda Baker in her radio play She Knows Y'Know in 1997. Baker wasn't very popular in the business and very few people attended her funeral. Maybe the play tells why." "I too thought the Randle play very well done. A name so very famous then but so little known today. He was featured in a radio documentary by Mark Radcliffe recently. Hylda Baker suffered from dementia in her final years and believed she was Nellie Pledge, her character from the Nearest and Dearest TV series. I know that she and co-star Jimmy Jewel loathed each other. A Baker radio play would be most welcome." See this link to the Cuthbert Club of the Frank Randle Blue Plaque unveiling ceremony on 07/07/07 - in stills and video - on the North Pier at Blackpool. The Cuthbert Club reveres the daft genius of Wigan's own Frank Randle. Frank Randle, King Fun of Blackpool, who died in 1957. The play is a tribute to Franks genius and a fond memorial. "Strange things have been going on at an old hospital in Rochdale for years. There's the spectral sound of a baby crying in the night when all the wards are shut, and sightings of a small, thin, round-shouldered man who wanders along the main corridor at all hours, accompanied by a mongrel. If ghost stories are your thing then look no further than this new play by Trevor Hoyle in which a perplexed woman from our century finds her destiny entwined with a destitute young girl from Victorian times." Trevor Hoyle's ghost story, set in a hospital in Rochdale, is driven by two parallel storylines. One is contemporary while the other is set in the late 1800s and draws on real events that took place in the Dearnley Union Workhouse. Producer/Director: Liz Leonard. Blake's 7, the popular BBC1 space adventure series, ran from 1978 to 1981. Terry Nation, its creator, delivered the pilot script in April 1976. The series was announced to the public at the start of June 1977, by which time the novelisation rights had been sold to Sphere Books. It was decided that the first four scripts would form a novel for publication in December, shortly before the series went on air at the start of January 1978. As such, writer Trevor Hoyle was given the task of adapting Nation's screenplays while the show was still in production, since live-action shooting did not start until the last week of September 1977. The series quickly attracted a cult following, and a hardback edition - credited to 'Trevor Hoyle and Terry Nation' - was published by Arthur Barker in May 1978. The Sphere edition remained in print through to the early 1980s, and as the series was later syndicated across North America, an American edition entitled Blake's 7: Their First Adventure appeared from Citadel Press in August 1988. 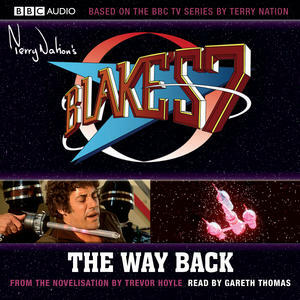 Having written the first Blake's 7 novelisation, Trevor Hoyle followed this up with two more in the series. Blake's 7: Project Avalon (1979) and Blake's 7: Scorpio Attack (1981), as well as a script for the fourth series entitled Ultraworld (1980). His early SF work included the 'Q' Series featuring myth technologist Christian Queghan, starting with Seeking the Mythical Future (1977). Also in his range of more speculative fiction, rather than straight SF, are The Last Gasp (1983) - currently under option to a Hollywood production company - and Vail (1984), a dystopian vision of Britain as a police state under attack by terrorists. "When Malcolm Lowry died 50 years ago, he left behind a jumble of manuscripts and two memorable novels: Ultramarine, based on his experiences at sea as a young man, and Under the Volcano, concerning the last alcohol-fuelled 24 hours of an English ex-consul in Mexico, also a semi-autobiographical story. As novelist and playwright Trevor Hoyle explains, Lowry's demons lay behind much of his fiction, yet they were accompanied by humour and courage. A re-evaluation of this complex and driven man, with archive clips of people who knew him, and extracts from his work." 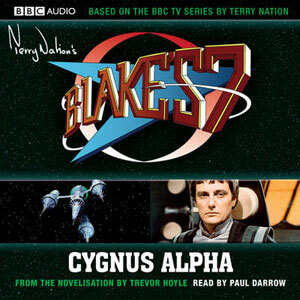 See also this link to Trevor Hoyle radio drama on the Diversity website.